It's one of the more difficult races to run in track and field, requiring speed and pure guts to excel at the elite level. And that's exactly what appeals to Theo Burba about his specialty, the 600-meter run. "I love the race because in order to be competitive it has to be an all-out sprint from the gun," said the Newton North junior. "It just bodes really well with my character. I love that all-out sprint." Competing his first competitive 600m race this season at Sunday's Winter Festival Large School meet, Burba looked smooth and relaxed, winning with a nation No. 3 of 1 minutes, 22.81 seconds. He led four other runners under 1:25 for the three-lapper - Andover's Devin Connell (second, 1:24.13), Leominster's Jonathan Polanco (third, 1:24.39), Newton North's Raghav Kadambi (fourth, 1:24.81) and Woburn's Mark Swymer (fifth, 1:24.89). The Tiger standout's time was a little less than four seconds slower than his sensational 1:18.87 from last year's sophomore season. But for a race in mid December, he was more than content with the outcome. "In the past, the fastest I have ever been able to open the season with is a 1:25," said Burba, who hit his opening 400m at 54 seconds. "Today, to open up my season with a 1:22, three seconds faster, it definitely bodes well for the season to come." 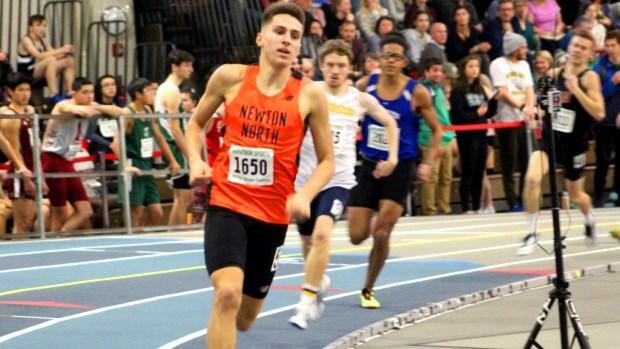 Newton North, a team that will be looking to make it 20 straight undefeated seasons in the Bay State League, also had a victory from Andrew Mah in the mile. He clocked even splits en route to a first-place time of 4:27.67. Mah led from start to finish, passing the 800m mark at 2:14. "I was just trying to get a good time," he said, "so I just took it out from the start." Haverhill's Keith May won a close race in the 1,000. May broke the tape in 2:37.33, just .05 ahead of Chelmsford's John Mieszczanski. Woburn's Anshel Isles was third at 2:38.22. In another nail-biter, Woburn's Alexina Hurley held off Shepherd Hill's Emma Sullivan in the 1,000m. Hurley was timed in 3:05.01 to Sullivan's 3:05.23 effort. "I was kind of hoping for sub three (minutes),"" said Hurley, who owns a best of 3:00.96 for last year. "But I also know it's early in the season so I'm happy with what I got." Wellesley's Anna Jordahl-Henry clocked a nearly two-second PR in the 300m dash with her time of 40.61. She was also second to Hingham's Lila Belsher in the high jump with both clearing 5 feet, 4 inches. Newton North's Einat Gavish out-dueled Hopkinton Schuyler Gooley in the mile. Gavish finished at 5:19.05, while Gooley secured second at 5:19.15.